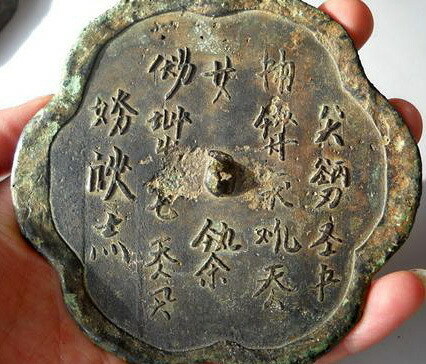 The mirror was reportedly found somewhere in the viscinity of Ulanqab in central Inner Mongolia. This would have been on or just beyond the border of the Jin regime (during which time the mirror was cast), and somewhat distant from the Khitan homeland of Liaoning and eastern Inner Mongolia, where large numbers of Khitan memorial tablets dating to the Liao and Jin dynasties have been found (see map). However, we would expect to see a wider distribution of portable objects such as mirrors compared to the distribution of memorial tablets, so the find location is plausible. On the 19th day of the 9th month (the month of the wood dog) in the 2nd year of the Tiande era (the year of the metal horse) , the Prince of the State of Yue. The reason why this particular inscription is so easy to translate is that it uses a limited range of calendrical vocabulary that is attested on many monumental inscriptions. For reference, I have provided several tables of calendrical vocabulary for both Khitan large and small script at the bottom of this post. These are largely, but not entirely, based on Professor Daniel Kane's The Kitan Language and Script (Brill, 2009). The images of small Khitan logograms and phonograms on this page are from an experimental small Khitan font that I created especially for this blog post. I intend to work on this font further after the summer, and will make it available for free download at a future date. In the meantime, I have made Professor Kane's list of 380 small Khitan glyphs available here. The Small Khitan script is a mixed writing system comprising single-character logograms representing the meaning of certain high frequency words such as numbers, together with multi-character phonogram clusters (which I will call "polygrams", following Vladimir Sergeevich Starikov) that represent the pronunciation of a word (a few characters act as both logograms and phonograms). A polygram comprises between one and eight phonograms arranged into a rectangular block, with the individual phonograms making up the polygram ordered left-to-right and top-to-bottom. The readings for phonograms given here follow Kane 2009, and the reconstructed pronunciations for Chinese glosses of Khitan words have been kindly provided by Marc Miyake. Logogram meaning "heaven", here used as part of a reign era name. Khitan reign era names almost always start with either this character or the logogram for "great". d.iu.rẻn Polygram representing the Khitan word meaning "virtue" (Chinese dé 德). This and the preceding word "heaven" form the Khitan name for the Jin dynasty Tiande (天德) "Heavenly Virtue" reign era (1149–1153). Logogram meaning "year". Up to this point the inscription means "2nd year of the Tiande era", which corresponds to the year 1150.
ai.en Polygrams representing the Khitan word for "cyclical year" (Chinese suìcì 歲次), which go with the following two words to give the cyclical year corresponding to the reign year Tiande 2, i.e. the year of the metal horse. Logogram meaning "white", here corresponding to the element metal and the heavenly stem 庚 (gēng) in the Chinese calendrical system. mo.ri Polygram representing the Khitan word "horse" (cf. Mongolian ᠮᠣᠷᠢᠨ‌ mori(n)), corresponding to the earthly branch 午 (wǔ) in the Chinese calendrical system. *sair Logogram meaning "month". The Chinese gloss for the Khitan word for "month" given in the History of the Liao Dynasty is 賽咿兒 (sàiyī'ér) *sair, cognate to Mongolian ᠰᠠᠷᠠᠨ‌ sara(n) meaning "moon" or "month". s.au.qu Polygram representing the Khitan word that corresponds to the element wood and the heavenly stem 甲 (jiǎ) in the Chinese calendrical system, probably meaning "blue". This word is also written as s.iau.qú or s.iau.qu, with different medial and/or final phonograms. The medial phonogram as written on the mirror looks like Kane 191 (mú) but is in fact Kane 161 (au). ńi.qo Polygram representing the Khitan word "dog" (cf. Mongolian ᠨᠣᠬᠠᠢ‌ noqai). ho.l.bun Polygram of uncertain meaning that always occurs after lunar cyclical dates, presumably indicating that the preceding two words are the cyclical terms corresponding to the calendar month. Logogram meaning "day". The Chinese gloss for the Khitan word for "day" given in the History of the Liao Dynasty is 捏咿唲 (niēyī'ér) *ñair, cognate to Mongolian ᠨᠠᠷᠠᠨ‌ nara(n) meaning "sun". y.e Polygram representing the Khitan transcription of the Chinese place name Yue 越. The first phonogram is the same as the logogram for "month" (see above), but here may be equivalent to the dotted form of the same graph that is elsewhere used as a phonogram for y.
g.ui Polygram representing the Khitan transcription of the Chinese word 國 "country". In modern Mandarin 國 is pronounced guó, but in Old Mandarin it was homophonous with characters that are pronounced gui in modern Mandarin (cf. the Phags-pa spelling of ꡂꡟꡠ gue for 國). The native Khitan word for country is g.úr.en, cognate with Jurchen gurun and Manchu ᡤᡠᡵᡠᠨ‌ gurun. oŋ Polygram representing the Khitan transcription of the Chinese word wáng 王 "prince". These last three words together transcribe the Chinese title 越國王 "Prince of the State of Yue", and is attested on the Memorial for Xiao Zhonggong (see below). Please see this post (2011-07-10) and this post (2011-07-11) on Amaravati: Abode of Amritas for Marc Miyake's notes on the Khitan characters on the mirror inscription. Who was the Prince of Yue? The Prince of Yue refers to Xiao Zhonggong 蕭仲恭 (1090–1150) [《金史》卷八十二], a Liao dynasty general who was captured with the last Liao emperor in 1125, and who subsequently pledged allegiance to the Jin dynasty. He served the Jin dynasty faithfully for twenty-five years, serving in various high positions and receiving numerous titles. In the first month of Tiande 2  he was made Prince of the State of Yue, but just a few months later, on the 2nd day of the 5th month, the day before his 60th birthday, he died of natural causes. Xiao Zhonggong's tomb in Xinglong county, Hebei was robbed by local peasants in 1942, and his memorial tablet was discarded on the open ground nearby. 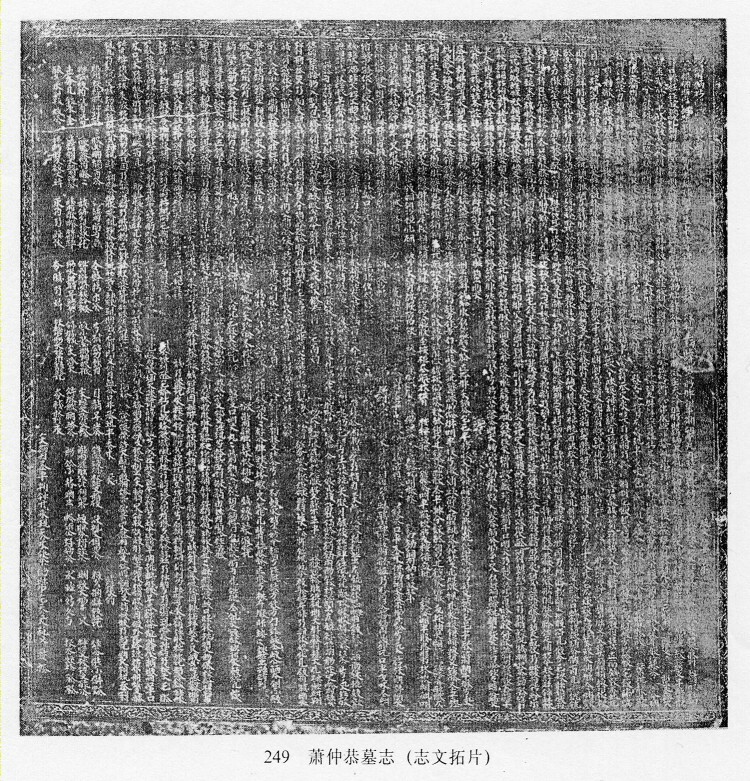 In 1954 the memorial tablet was recovered by the Jehol Provincial Museum, and found to comprise a long inscription in the Small Khitan script (at 50 lines in length, it is one of the longest known Khitan texts). The middle three words, now defaced, apparently read "Prince of the State of Yue" (越國王) in Khitan, although I cannot make them out. The bottom two characters on the 3rd (leftmost) line are the Khitan for "memorial tablet" (墓誌). 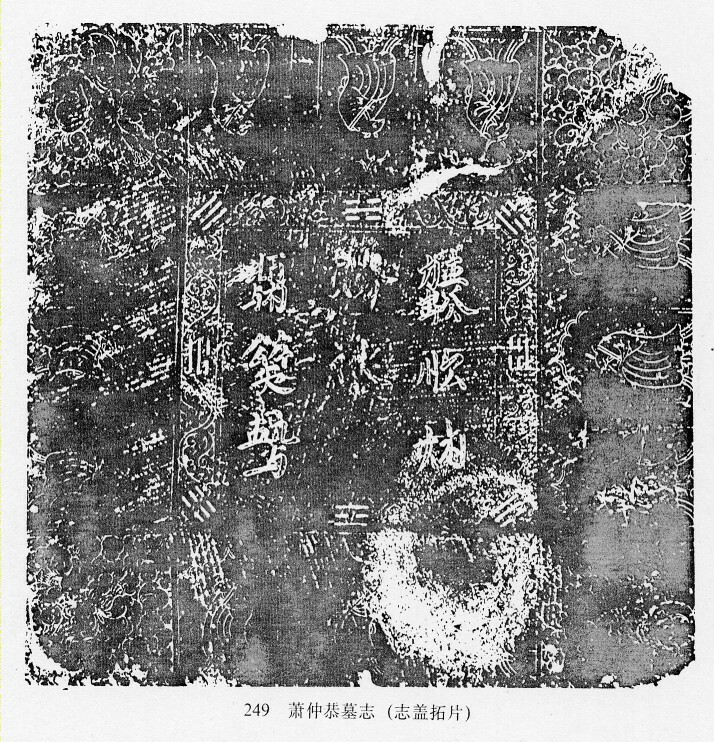 The memorial tablet for Xiao Zhonggong is dated the 19th day of the 9th month of Tiande 2, the exact same date as the inscription on the mirror, and so it can reasonably be supposed that the mirror was cast in memory of Xiao Zhonggong at the time of his entombment. In conclusion, we have an inscription that on the one hand is completely understandable, but on the other hand tells us almost nothing about the Khitan language. We can work out the rough pronunciations for a large number of Chinese words transcribed using Khitan polygrams, and work out the meaning (but not pronunciation) of logograms representing a small number of Khitan words, with the result that we can read and understand simple sinified Khitan text, but still we don't have much of a clue when it comes to pure Khitan text. Sadly, this mirror merely reflects our fundamental lack of understanding about the Khitan language. Both Khitan scripts continued in use for at least fifty after the fall of the Liao dynasty in 1125, and memorial tablets dating to the 1170s are known in both the large and small scripts. It is thus that the Khitan names for about twelve Liao dynasty (916–1125) eras and six Jin dynasty (1115–1234) eras have been deciphered. Almost all the known Khitan era names start with either the logogram for "heaven" or the logogram for "great", although in some cases this appears to be an optional prefix which in some circumstances can be omitted. Some of the Khitan era names are direct translations of the corresponding Chinese names (e.g. the Da'an era name means "great peace" in both Chinese and Khitan; and the Tiande era name means "heaven virtue" in both Chinese and Khitan), but some Khitan era names only correspond partially to the Chinese name (e.g. the Qingning era name means "clear tranquility" in Chinese, but "heaven clear" in Khitan; and the Shouchang era name means "longevity prosperity" in Chinese, but "great longevity" in Khitan), and some Khitan era names seem to have no relationship at all to the corresponding Chinese name (e.g the Tonghe era name means "united peace" in Chinese, but "great inheritence" in Khitan). The Chinese calendar makes use of a sixty year cycle in which individual years are identified by means of a combination of one of ten "heavenly stems" (tiāngān 天干) and one of twelve "earthly branches" (dìzhī 地支). In the Chinese system pairs of adjacent heavenly stems are associated with one of the "five elements" (wǔxíng 五行). However, the Khitan terms corresponding to heavenly stems are generally thought to be colour names, which is also the case with Mongolian and Manchu. The reason why the Khitan terms are thought to be colours is that : a) Khitan small script words for "gold", "fire" and "water" have been identified, and these are not the same as the words used as calendrical terms; and b) the small Khitan character corresponding to the element "earth" is used to represent the name of the Jin dynasty in other contexts, and as Jin (金) literally means "gold", it is thought that as a cyclical term it means "golden yellow". However, it should be noted that no cognates with colour names in any other language have been identified, so it is not certain that the terms are all colour names. In the Chinese system the twelve earthly branches are associated with a zodiacal animal, and these animals have been adopted (with some small modifications) in all derivitive systems (Tibetan, Mongolian, Manchu, etc.). The Khitan terms corresponding to the earthly branches are the names of the associated animals. The Khitan names for rabbit, dragon, snake, horse, chicken and dog are cognate with the corresponding Mongolian words. The Khitan small script terms for "yellow" and "white" are written using logograms (which may be dotted or undotted in different contexts); all other small Khitan terms for the colours and animals are written as polygrams. All of the numbers in both large and small script are represented using logograms. There are special characters for the multiples of ten from twenty to ninety, which suggests that, as is the case for Mongolian, there were distinct words for these numbers. The numbers one through nine (exept seven) occur in undotted and dotted forms, which may indicate grammatical gender, the undotted form used with feminine and neuter words, and the dotted form used with maculine words. Because the numbers are represented using logograms it is not easy to reconstruct their pronunciations. However, we are able to work out the pronunciation of a few numbers based on the use of the logogram as a phonetic element in other words. For example, the large Khitan character for "five", which is identical to the Chinese word for five (wǔ 五), also occurs as the first character in the large Khitan script word for "rabbit" (glossed as táolǐ 陶里 in the History of the Liao Dynasty), and as the second character in the large Khitan transcription of the Chinese title zhāotǎo 招討 "bandit suppression [commissioner]", which suggests that the Khitan word for "five" was pronounced tau, probably cognate with Mongolian tabun ᠲᠠᠪᠤᠨ "five". 日 Day [glossed as "捏咿唲" (niēyī'ér) *ñair in the Liáo Shǐ] nara(n) "sun"
How did you create this font?...I'd like to make a study site focused on both small script and large script Khitan, further opening this language to others. One of my on-going projects is to create a Khitan Large Script font based on the known monumental inscriptions. To date I have gone through 3½ inscriptions and added 920 glyphs to the font (including many obvious variants and many not so obvious variants), but I have a long way to go before it is ready for public release. I have also created a Khitan Small Script font based on the "Index of Graphs" given in Daniel Kane's The Kitan Language and Script (Brill, 2009) which I should have released already but forgot to. Based on that font, I also have a prototype Khitan Small Script font that automatically combines sequences of phonograms into a polygram block (as seen in this post) -- this works in certain applications under Windows XP (shaping behaviour works in BabelPad but not in Notepad), but does not work at all in Windows 7 (apparently a bug in Uniscribe), but should work in Windows 8. I will release an improved version of this font when Khitan Small Script has been accepted for encoding in Unicode. Very interesting research Andrew. A fascinating civilization that has unfortunately been overshadowed in the big picture of "Chinese history".